At a Critical Lass ride. “On a Roll with” profiles women who ride from around Washington to demonstrate and celebrate the diversity of bikes, routes, gear, clothing, ages and stages of your cycling sisters. If you’d like to share your story here or want to suggest someone, drop me a line: bikestylespokane-at-gmail.com. Technically a stay-at-home-mom, but we’re rarely home. Recently someone asked me if my “job” was to bike the kids around all day…and it is! I’m also a bicycling advocate-in-training thanks to Cascade Bicycle Club’s Advocacy Leadership Insititute. My mother. She was born and raised in the Netherlands so it’s been wonderful visiting relatives and seeing so many people biking as part of their everyday life. My mom didn’t always bike in America, but I remember her often commuting uphill to her job at UC Berkeley on an old mountain bike. My main bike is a Surly Big Dummy longtail. It holds two kids plus all our gear and groceries and then some. The best add-on on it is the locally made Rolling Jackass centerstand. I’ve managed to tip the bike a couple times, but it’s nearly impossible. I can park on a slope, the kids can use the bike as a jungle gym (not recommended), and uneven loads are not a problem. My previous mamabike is a Bianchi Milano city bike with front Bobike mini baby seat and rear Bobike maxi toddler seat. We still fit on it and it fits on the bus bike rack so we use it occasionally for faraway treks that involve the bus. Some day it will be my around-town bike. I’ve never been much of a cyclist, but hauling my heavy cargo bike around has made me appreciate my light Specialized Dolce road bike…although it’s usually weighed down with an attached trail-a-bike and trailer (yes, both at the same time, in a long line). Seattle has a couple fast (to me) monthly ladies’ rides that I like to participate in when I’m able to escape my littles: Menstrual Monday and RAW Retreats. My unused-as-of-late mountain bike came in handy for our two days of snow last winter, too. I hooked it up to the double trailer and was able to get out of the house thanks to its knobby tires. I generally stick to commuting to places within a few miles of home, but I’ve had some 30-mile days. Of course, those long days are broken up by many stops at various kiddie places, like swim lesson, playground, and wading pool. Over the last few years, I’ve built up to riding just about every single day. There are a couple neighborhoods I don’t frequent due to their altitude–Capitol Hill and Queen Anne–but otherwise we find ourselves all around Seattle. “Do you have a motor?” While I may have to employ an electric assist at some point, I like that I’m able to get around by pedal power alone these days and I love when people are surprised to see I’m not motorized. I just wear regular clothing. I had thought to stop wearing flip flops because my cool, flashing Pedalite pedals are very grippy and occasionally send a shoe flying, but so far passersby have retrieved my lost shoes before I’ve had a chance to engage my double kickstand and go fetch them so it’s not too big a problem. What things do you wish were different about your bike and gear or women’s clothing or both that would make it easier to bike and look good/feel comfortable, if this is something you give any thought to? I’ve actually started dressing a bit better since biking with kids. 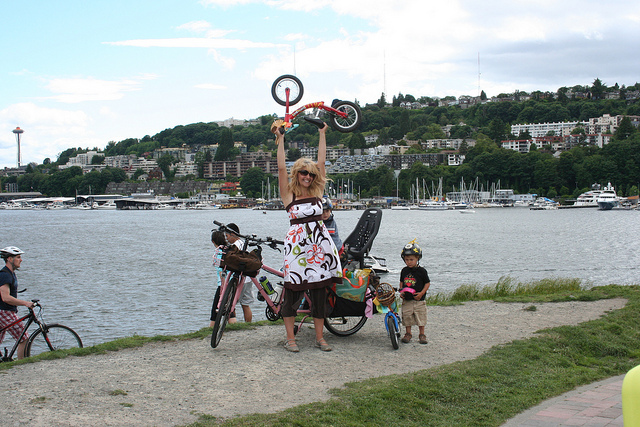 The biking mamas in Seattle are pretty stylish and have been a good influence on me. I’ve never been much of a skirt wearer–not at all related to biking comfort, mind you–but now I wear them quite often. One thing: before getting my Big Dummy in December, I had no idea that front derailleurs didn’t come with chain guards. I’d only worn shorts with my road bike and mountain bike before so it wasn’t an issue. There are a few out there, but not one I’m aware of that fits my bike. I think I could give up one of my three rings and put on a bash guard for some pants protection, but I need all my 27 gears! What is needed to make your (neighborhood, town, state, usual destinations) an even better place for women to ride their bikes? We need some separated cycle tracks here in Seattle! Much of my riding is on multi-use trails, but I also have to share streets with cars every day and it’s not ideal. The Neighborhood Greenways movement is very exciting and will make neighborhood riding safer, but I’m eager to see some better solutions for busy streets. In December I was able to fit three days worth of stuff and the kids on my city bike and ride to the train station for a trip to Portland. The uphill ride home was probably the hardest biking part, but the whole trip was a great adventure. Granted, a friend with a cargo bike (also a Surly Big Dummy) met us at the train station and took over carrying some of my luggage during a tour of the city. I can’t wait to do more traveling by bike. Even in rain, I’d much rather be out on the bike than trapped in a car. 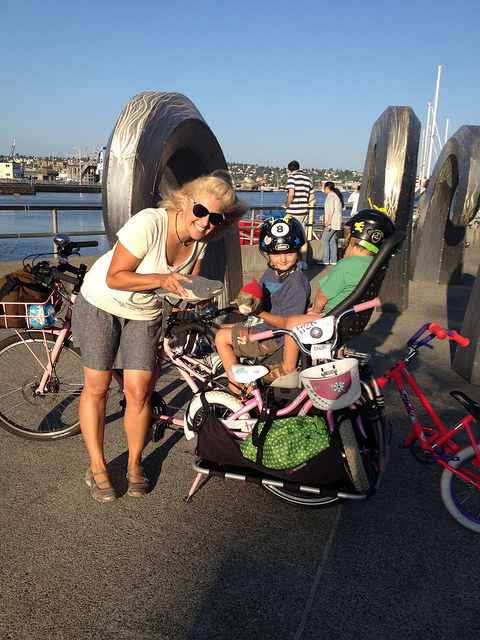 The kids are much happier, too, which makes the bike an even easier transportation choice. I’d love to give some encouragement to women who want to start riding more. Local rides are wonderful way to get out there. 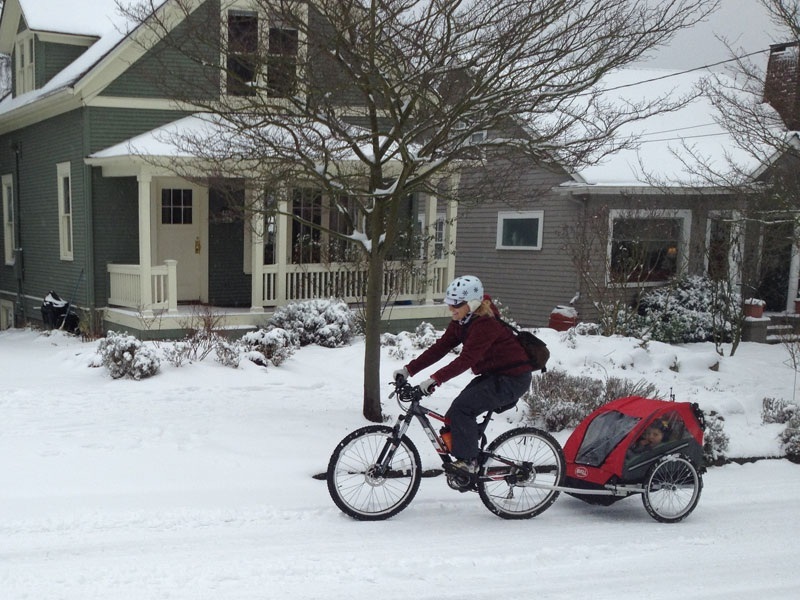 Here in Seattle, the Cascade Bicycle Club Daily Rides Calendar lists oodles of rides, including the casual Critical Lass and Spokespeople rides. Online challenges are fun, too. Participating in 30 Days of Biking is what truly turned me into an everyday bicyclist.